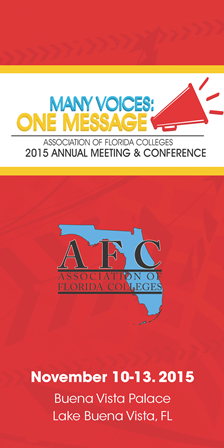 Please enjoy these presentations from the 2015 AFC Annual Meeting and Conference. They will be accessible to non-members for a limited time only. Once they are archived, you must be a member of AFC in order to access them. This panel will examine the role of military personnel in our nation’s institutions of higher learning as students, staff, faculty and administration. The purpose of this panel is to examine the various roles military personnel play at war and how Academic and Student Affairs can use those skills to strengthen community outreach, recruitment, retention and marketing of institutions and their clientele. Students who take college-level math courses must purchase a Texas Instruments graphing calculator for $100. This has been a requirement for 20 years. Much research has been produced in those 20 years that show learning gains for students who use graphing tools compared to those who do not; hence it is a good justification to require the graphing calculator. There is no debate that graphing calculators are a valuable learning tool for students; they allow students to visualize theoretical concepts, explore and investigate new topics, and check required analytical (by-hand) work. Graphing calculators are a wonderful tool that can be used to engage students in active learning through unique activities in and out of the classroom. In today’s world, most scientists/engineers don’t carry around a hand-held graphing calculator but instead have mobile devices such as phones, tablets or laptops with even better capabilities than a graphing calculator. This year I ran a pilot study to not require a hand-held calculator in an effort to save money for students. I have used web-based tools (almost all free) to replace the graphing calculator and it has been successful. Most students have smart phones, tablets or laptops in class; so it has been relatively easy to implement the use of web-based graphing tools and apps. I am excited about the results so far and am looking forward to implementing more tools over the next few years. As instructors, we can still use visual tools for learning in the classroom, in fact we should use those tools. However, we no longer need to require a hand-held calculator to harness the power of visual tools, in fact we shouldn’t require! This presentation will focus on pre and post retirement planning, the different stages of retirement, factors to consider and pitfalls to avoid.